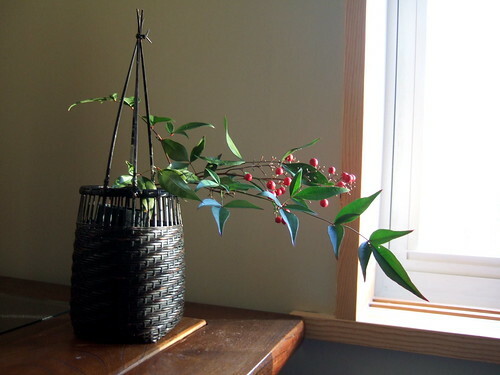 Photo: Ikebana in the sunrise room (the guest room with Japanese decor) of Pembroke Springs Retreat. I haven’t had a proper bath in a year-and-a-half. A friend was concerned that I was missing Japan a bit too much, and I tried to express the whole body feeling of fatigue and yearning for something warm—40ºC actually—I missed onsen. A good portion of our travel experiences in Japan revolved around bathing. Our best memories are of checking in at a ryokan (traditional inn) with natural hot-spring baths. Before dinner we’d soak for an hour or two, get into our yukata (cotton robes), and be served a fabulous kaiseki dinner in our room. We’d eat, drink the local sake we’d picked up in town, and fall into a warm, pink-cheeked slumber. In the morning, we’d soak some more and eat some more, and head out to explore the local area. Who wouldn’t miss that? The next day Carlos made reservations at at Pembroke Springs Retreat in Star Tannery, Virginia. Only a few weeks to wait and I’d be bathing. Photo: View from the common room. Last Friday, as we were getting ready to take the road to the deep north of Virginia, the manager, Lisa, called us to tell us shocking news: the Japanese baths were not working. The extreme cold had first knocked out the pump and then the pipes had frozen. Did we still want to come? She promised us a Jacuzzi tub in one of the rooms. The scenery and the Japanese dinner and breakfast were still on offer. We felt the urge to get away, bath or no bath, so we headed west on Route 66, well, not that 66, I-66, heading for the cow farms and rolling hills of the Shenandoah Valley. The B&B is on 175 wooded private acres. One drives through the forest, past a pond which is fed by a natural spring, and up to the main building. The B&B is run by Taeko and Walter Floyd and their daughter, Lisa, who welcome you as if you are coming to their home. 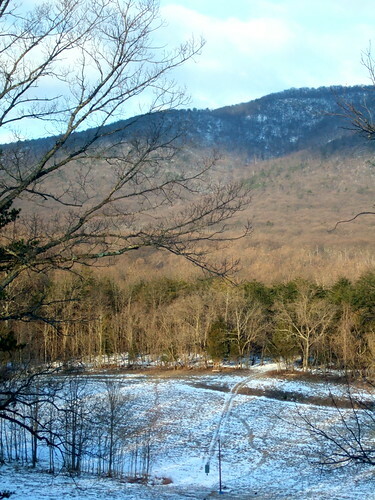 Carlos marched out into the cold to try the hiking trails on the property. I sat and read a book while facing the mountain forest view from the common room. Taeko brought me warm apple cider with cranberries. I tried not to bother her too much with questions as she prepared our Japanese dinner. The conversation was warm and filled with memories of Japan and the sorry state of their ofuro below, which is fed by natural springs and then heated. Photo: Sake with dinner, more on that in a later post. Before dinner we had a bath in a large Jacuzzi tub in one of the guest rooms. Warm and happy, we had a lovely home cooked meal including a first course of sautéed shrimp and scallops, with a side of homemade salt pickles, followed by chicken katsu and shredded cabbage with kushiyaki (grilled vegetable skewers) and miso soup and rice. 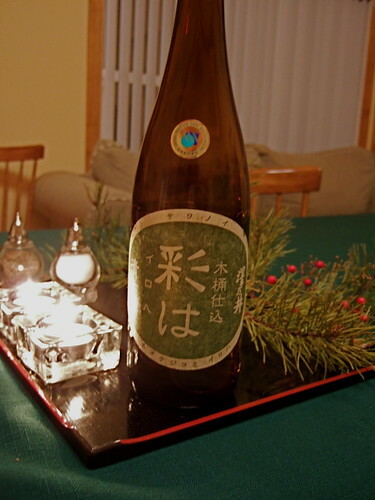 We graced our meal with a sake we brought from home: Sawanoi kimoto junmai. Dessert was ice cream topped with tsubu-an (chunky red bean jam). Photo: Breakfast. 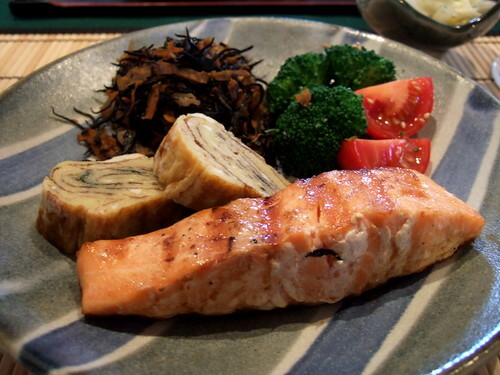 Grilled salmon, hijiki nimono with konnyaku and carrots, tamago yaki (omelet). 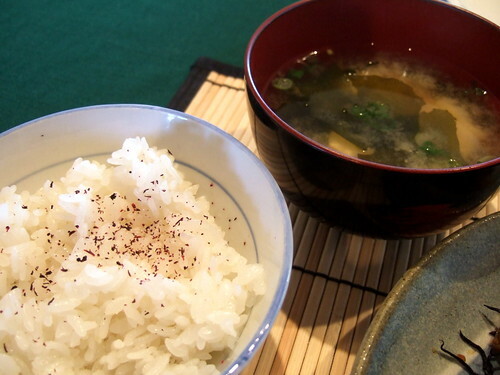 Photo: Breakfast, rice, miso soup. In the morning we were treated to a Japanese breakfast and a long discussion about John Manjiro, a Japanese man who was shipwrecked in 1841, rescued by an American whaler, and taken to Massachusetts. He returned to Japan in 1851 after receiving a high-school education, and later acted as an interpreter and cultural go-between during the first interactions between Admiral Perry’s delegation and the Japanese shogunate. 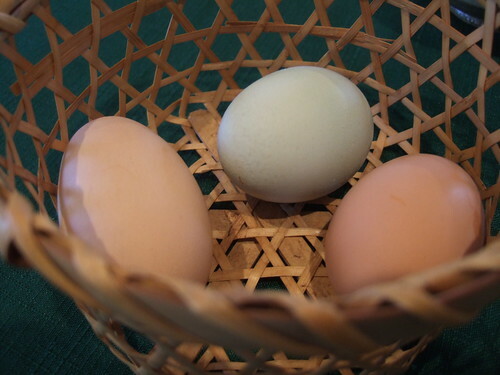 Photo: Raw eggs to crack over rice from Taeko and Walter’s Rhode Island Red and Araucana chickens. The Floyd’s have created a personal and beautiful oasis that combines the casualness of an American country inn with flavors (and baths) of a Japanese ryokan. We were enchanted and will return when the baths are fixed and the weather is slightly warmer for hiking. My daughter spent a semester in Japan and I am so looking forward to sharing your blog with her. Thank you for truly offering something different in the blogisphere.